Our hideaway beds collection includes a selection of storage cabinets transformable into single or double beds, cabinets with drop down opening which become comfortable beds for one or two guests, foldaway beds hidden in cabinets with casters. Easy to open and close, these convertible items are the right solution to create all the sleeping accommodations you may need. Perfect for an everyday use in studio apartments, small houses, or holiday homes, they are also very useful to accommodate your guests for the night. Smart, compact, and functional, they are perfect to make the best of any kind of space and environment. Night n' Day 564 is a drop down murphy bed with slatted base and structure made of wood covered in melamine, streaked white and light elm. Pillow and mattress available in different models. Night n'Day 566 is a hideaway double bed. 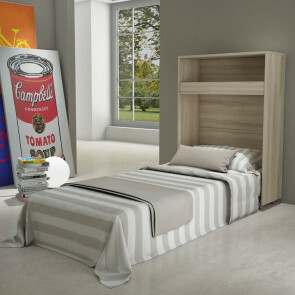 A 41 cm space-saving cabinet with drop-down door that reveals a 209 cm deep bed. Available in white or elm wood and with optional upholstered headboard. Night n' Day 568 is a wooden cabinet with single drop down bed; a comfortable bed for every day or to accommodate your guests. 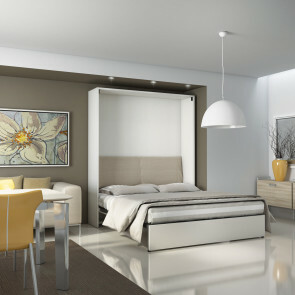 A space-saving murphy bed, easy to open and close. Link 538-A is a folding single bed that can turn into a dining table or a desk. Melamine space-saving furniture available in white or light elm with swivel casters. Link Bed 539-A is a fold up single bed for small flats or holiday houses. Double-faced space-saving cabinet it can also be turned into a desk and a table. Link is a cabinet with built-in foldaway bed. The single bed features wooden slatted base and mattress. The cabinet comes with casters to make the movement easier. 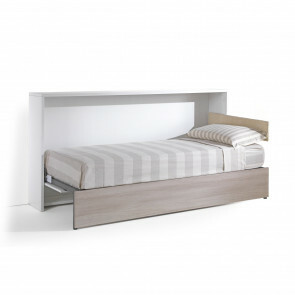 Link bed 539 is a cabinet convertible into a single bed with mattress included. Easy to move thanks to its casters, convenient thanks to the internal compartment that can hold pillows and blankets.